Very light cover wear, solid binding, marginal lines and annotations present through text. In May 1997, a group of distinguished historians announced the formation of the Historical Society, an organization that sought to be free of the jargon-laden debates and political agendas that have come to characterize the profession. Eugene Genovese, Prsident of the Society, explained the commitment to form a new and genuinely diverse organization. "The Society extends from left to right and embraces people of every ideological and political tendency. The Society promotes frank debate in an atmosphere of civility, mutual respect, and common courtesy. All we require is that participants lay down plausible premises; reason logically; appeal to evidence; and prepare to exchange criticism with those who hold different points of view. Our goal: to promote an integrated history accessible to the public." From those beginnings, the Society has grown to include hundreds of members from every level of the profession, from Pulitzer-prize winning scholars to graduate students, across the ideological and political spectrum. In this first book from the Historical Society, several founding members explore central topics within the field; the enduring value of the practice of history; the sensitive use of historical records, sources, and archives; the value of common standards; and much more. 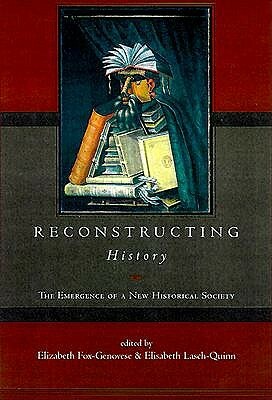 An engaging and challenging work that will appeal to scholars, students, educators, and the many public readers who have become lost in the culture wars, "Reconstructing History" is sure to generate the kind of civil, reasoned debate that is a foundational goal of the Historical Society. Contributors include Walter A. McDougall, Marc Trachtenberg, Alan Charles Kors, Deborah A. Symonds, Leo P. Ribuffo, Bruce Kuklick, Elizabeth Fox-Genovese, Gertrude Himmelfarb, Edward Berkowitz, John Patrick Diggins, John Womack, Victor Davis Hanson, Miriam R. Levin, Martin J. Sklar, Eugene D. Genovese, Daniel C. Littlefield, Elisabeth Lasch-Quinn, Russell Jacoby, Rochelle Gurstein, Paul Rahe, Donald Kagan, Diane Ravitch, Sean Wilentz, Louis Ferleger and Richard H. Steckel.